At age 21, James Edgar Broyhill left his father's Wilkes County Farm to attend the Appalachian Training School. He attended for four years, but went into the U.S. Army during World War I. Junior Achievement When he was mustered out of the Army, he went to work for his older brother, Tom H. Broyhill, in 1919 at Tom's furniture company in Lenoir. J. E. served as payroll clerk and later as the leading salesman. In 1926, he left his brother's firm and bought the financially ailing Lenoir Chair Company. As he built his business during the 1930s and early 1940s, he would purchase five other furniture factories that were bankrupt or near bankrupt. During World War II, Broyhill served on the Advisory Committee of the War Production Board and as chairman of the Furniture Advisory Committee of the Office of Price Administration. He lead the Southern Furniture Manufacturers Association for four terms during the 1940s. With the post-war boom in America, J.E. Broyhill made the companies profitable. By 1966, his plants were selling $75 million in annual sales. While building his businesses, J.E. 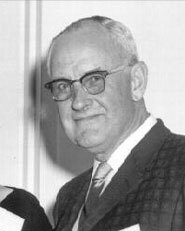 Broyhill became one of the leaders in a Republican Party in North Carolina, serving on the national committee from North Carolina from 1948 through 1965. In the early 1960s, Broyhill served on the board of directors of the National Association of Manufacturers. In 1980, J.E. Broyhill sold his furniture business for $151 million to Interco Inc., a diversified holding company of consumer goods manufacturers. Today, Broyhill Furniture is part of Furniture Brands International, the world's largest manufacturer of residential furniture.